This August the nation marks fifty years since the 1963 March on Washington, also known as the March for Jobs, Justice, and Freedom but best known for the stirring “I Have a Dream” address delivered by the Reverend Dr. Martin Luther King Jr. The Methodist Federation for Social Action welcomes constituents and friends to participate in the array of celebrations, colloquia, and actions commemorating that historic day, regarded as instrumental to the passage of the Civil Rights Act of 1964 and the Voting Rights Act of 1965.MFSA also invites you to renew the thirst for true wholeness as we recall that the journey is far from over. The recent Decision by the Supreme Court has sent critical provisions of the Voting Rights Act back to congress and, now as much as ever, there is a need to stand as witnesses to God’s vision of grace and justice, working together to clear the lingering stains of poverty, discrimination, and oppression. 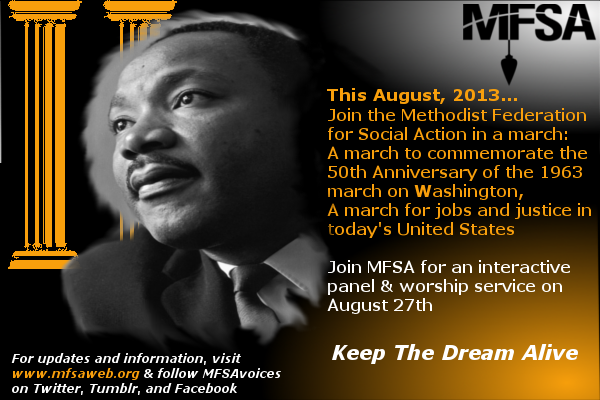 Join us for a time of learning, using our voices, and realizing King’s dream.